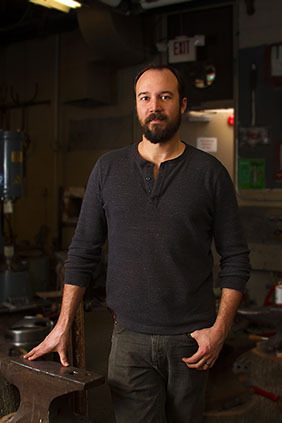 Adam Hawk is a studio artist and assistant professor of metalsmithing, sculpture, and foundations at Memphis College of Art. His work has recently been exhibited at the National Ornamental Metal Museum, Leigh Yawkey Woodson Art Museum, Walter Anderson Museum, and the Fuller Craft Museum. Hawk received his MFA in metalsmithing from Southern Illinois University Carbondale and BFA in sculpture and computer fine arts from Memphis College of Art. I have sketched, made things, and explored nature throughout life. From roaming the creeks and fields I grew up around, to traveling to foreign countries, my exposure to urban and natural aesthetics has had a major influence on my design vocabulary. In my youth I felt compelled to interact with and be drawn into my surroundings, and in my adult years nothing changed except the improvement of instruments and the distance of exploration. The focus of technique and craftsmanship in metalsmithing coupled with my obsessiveness when presented a new challenge comprise the basis of how I approach the act of making. The natural world guides me, and a simple rock becomes a vessel. The body of a ghost crab becomes an alphabet. Things outside of myself control the language I use to describe my experiences.